I've put a few new rings up in my Etsy shop! The first one reminds me of PTI's "Life" stamp set! (1) use a color that you would not typically use and (2) use a technique on your card that you have not used in a while. The technique that I chose to use (other than hand-cutting the kites which I rarely do) was to mix patterned papers. I am not the greatest at doing this but Lindsay has inspired me to give it a try again! She is the queen of mixing and matching patterned papers! For the second part of the challenge I chose to pick papers that I could use Berry Sorbet with. I don't know why but I rarely reach for this color. 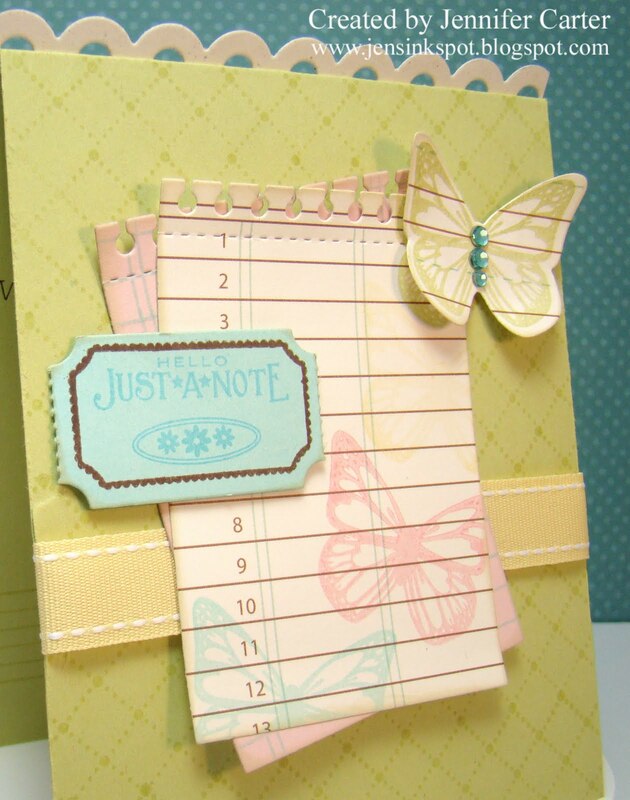 I didn't use it tons on this card, but I did incorporate it like was asked. The kites are popped up on pop dots to give dimension and all of the clouds are distressed with PTI's Tea Dye inks to match the background paper. Also, I just had to share with you another new ring I made (sorry if you are tired of these). I know I say this a lot but I really like this one! I listed it on Etsy and it sold in a few hours so I've relisted it again. 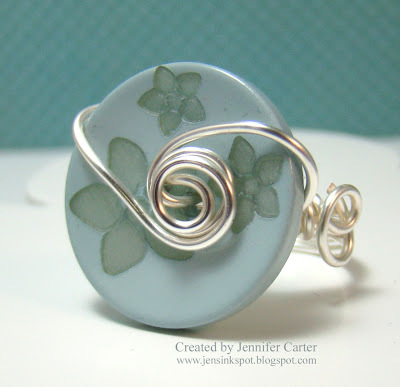 You can see more images of this ring and purchase it in your size at my Etsy store Jen's Ink Spot. Thanks for stopping by today! 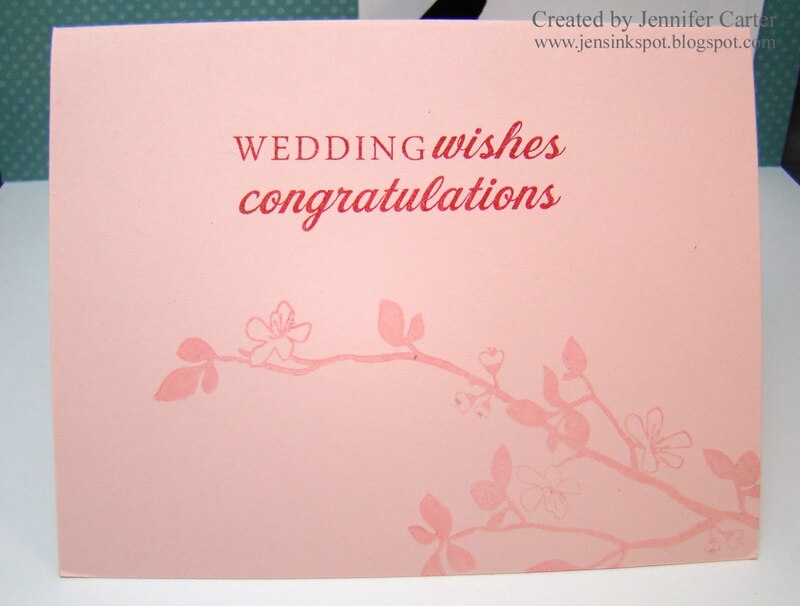 I hope you enjoyed this card (and ring)! Have a wonderful day! Jill of Anjillic Creations is hosting a Christmas in July challenge! How fun! This has been on my to do list all month and I figured I had better get after it since the month is coming to a close quickly (how is that anyway?). She wants everyone to join in and play along, so if you would like the chance to win a gift certificate to PTI (!!) then hop on over to her blog and enter your card! I had to turn to my inspiration book for this one! I really don't have many Christmas stamps in my supply right now. I've sold them all and haven't bought any to replace them. So, I flipped through my book to figure out what images I could use and make them Christmasy. And, a few pages in, I found the PTI "Round & Round" set. Wala! Instead of stamping a sentiment in the Mat Stack 3 die space I tied a ribbon. I really like this look. Thanks for stopping by today! 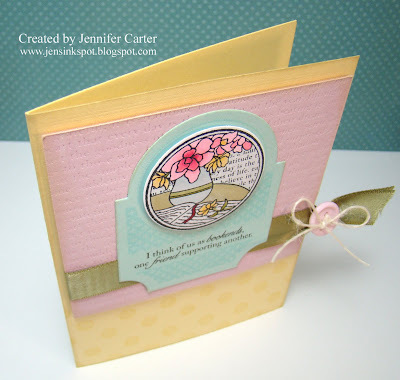 Don't forget if you'd like to play along, visit Jill's blog and enter your card! Thanks Jill for hosting this fabulous and fun contest! 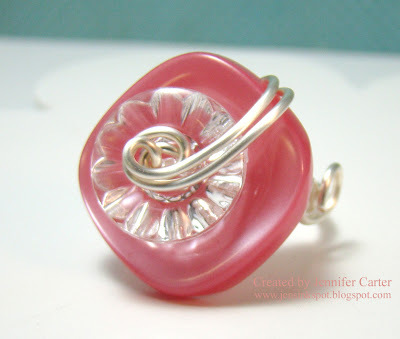 I just listed several new button rings in my Etsy shop! Below are some of them that I put up last night and I will have more new ones coming soon! Also, if you need help finding your ring size, you can now click on the tab at the top of this blog that says, "Measure Your Ring Size". This will give you step by step directions on how to determine what size of ring is just right for you! This one is my FAVORITE!! I just love it! 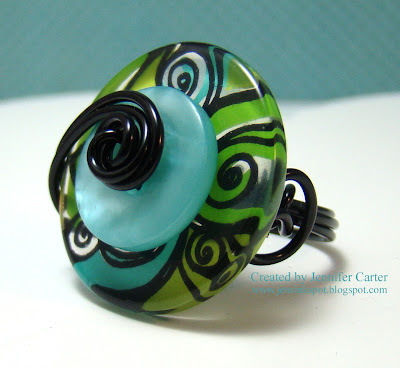 It is a one inch button but aren't those colors and swirls so much FUN!! And...the BEST part is that the button on top is from my favorite PTI color collection Hawaiian Shores!! LOVE!! This button is gorgeous and so uniquely shaped! This ring is neutral so it can be worn with so many different outfits! I've been looking for the perfect caramel button to put on top of the chocolate/caramel swirled button for months now and finally found the perfect one to compliment it! This one speaks for itself. Gorgeous and unique. The button is chartreuse green and features recessed green-painted flowers on it. This is a follow-up to my most popular ring the aqua & clear wire wrapped ring. This is the same style, just in a pink coral. It is such a gorgeous color! There are lots of other rings in my Etsy shop, Jen's Ink Spot, to see too! 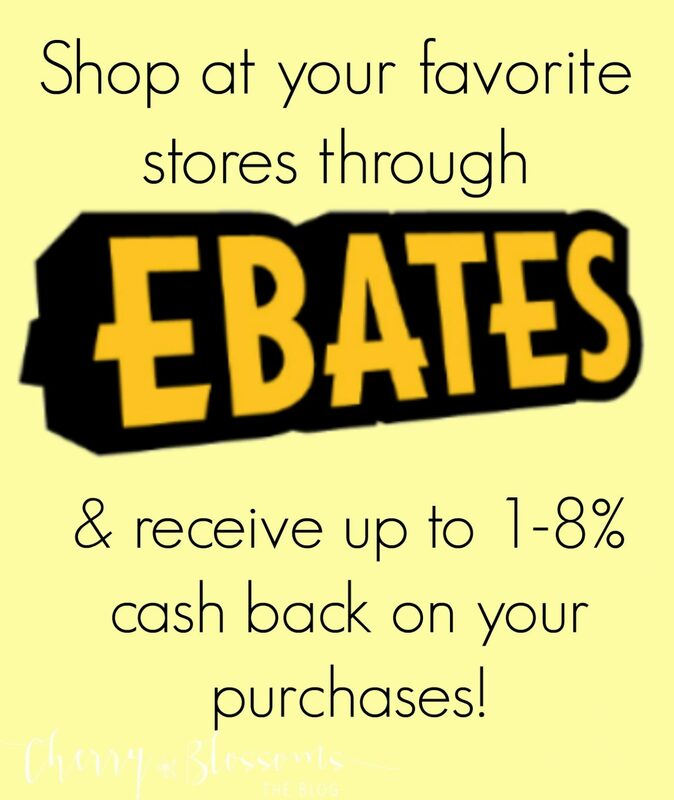 I'd love if you stopped by and took a look! 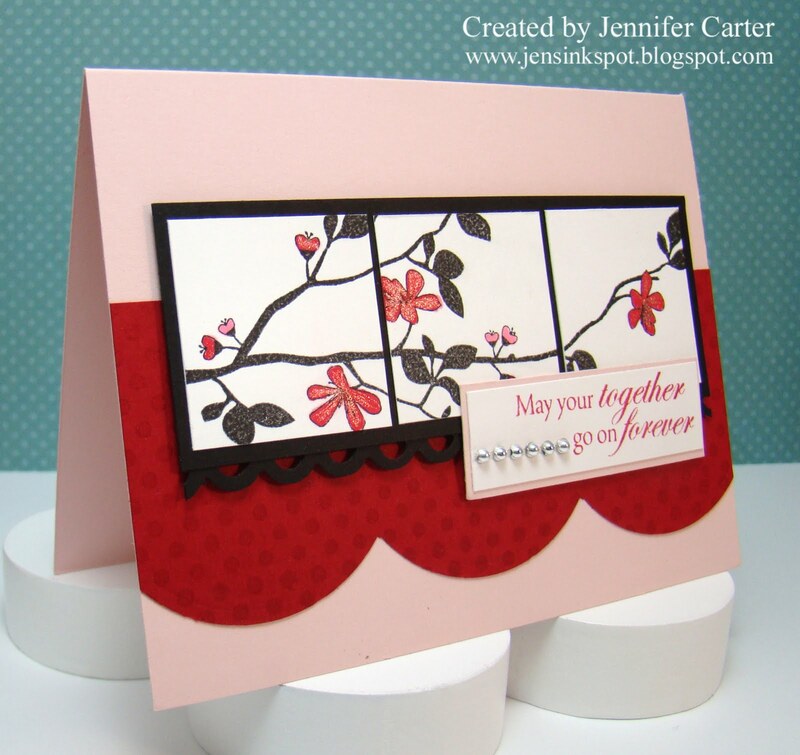 Welcome to July's Papertrey Ink blog hop! 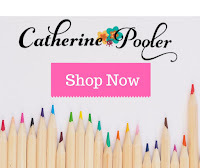 "For this month's blog hop we are focusing on office supplies! We want to see you incorporate all of those fun desk drawer fillers into your paper crafting projects. Reinvent these basic office staples to be hip and trendy additions to your projects! We look forward to seeing your creations!" I incorporated office themed stamps on this card. Isn't that fun topper cute? I saw this idea on a card here. I used the ticket border die and the butterfly die to make a paperclip bookmark as a little gift to the recipient. Kind of a fun little surprise to include inside the card! I made this card with a special friend in mind! She is one of a kind. You know, the one that you can spill your heart to and she doesn't see you as less. The kind that understands. The kind that doesn't judge. The kind that you just can't help but loving and appreciating. The one that you can talk to when you're down and can't talk to anyone else. She's the one I can cry with. The one I can share my frustrations with...and joys too. The one who always has a listening ear. Being a pastor's wife there are very few people who I can really share my heart 100% with, but I can with her. I am free to be myself. Isn't that the most perfect sentiment for a friend like the one I described? I knew as soon as I read it who would be the recipient of a card with that sentiment! She was at camp all week. I had VBS all week. We agreed to pray for each other during the week. I am so thankful for her. Thank you Shannon for the kind of friend that you are to me. I only hope that I can be that kind of friend back to you! Hello! Welcome to the Clean & Simple Blog's 100th Sketch Celebration! I was so excited when Natasha asked me to help celebrate this milestone! I love her sketches so much! She has provided us with another fantastic sketch and if you would like to play along, you can view the sketch and add your link at the CAS blog here. Also, be sure to visit the rest of the design team's blogs! Their links are at the end of this post. These stamps are so fun and I just love this color combination! Isn't this sketch great? It is so simple, yet it has so many possibilities! Thank you so much for stopping by today! I hope you enjoyed these cards! If you'd like to play along, be sure to visit the Clean & Simple blog and post a link to your card! 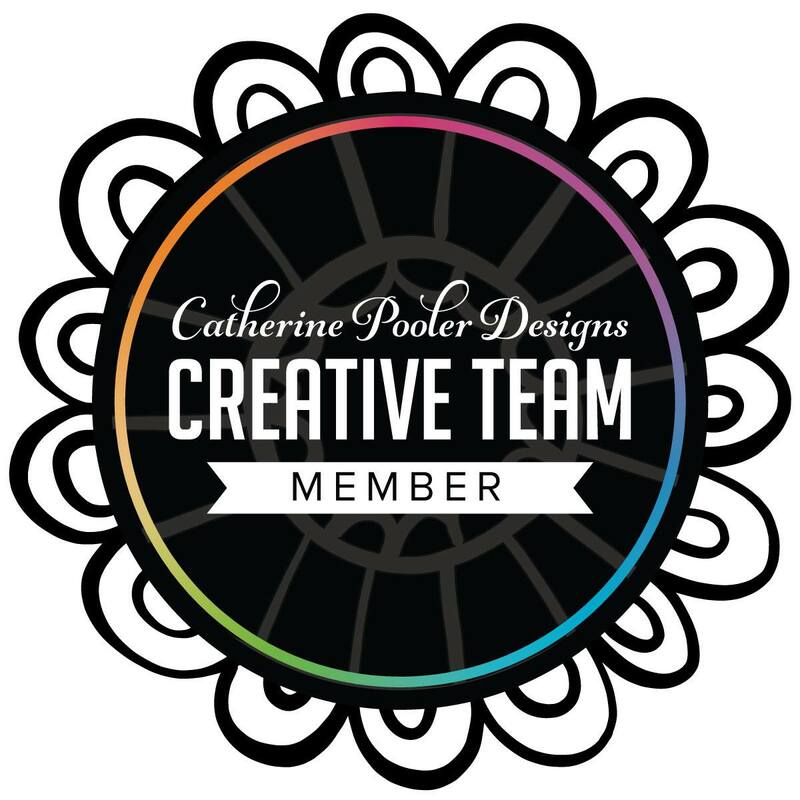 Be sure to visit the rest of the design team's blogs! Hello! How are you doing? Thanks for stopping by today! 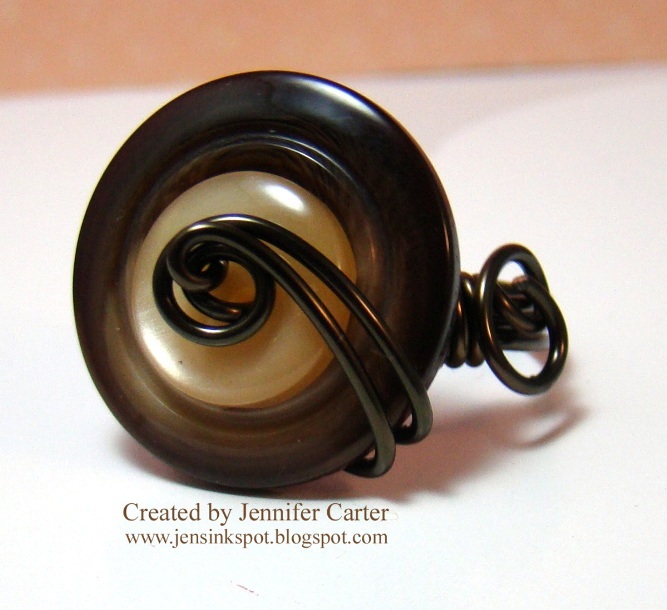 I wanted to share a few of the new rings that I have added to my Etsy shop, Jen's Ink Spot. These can be purchased through my store and can be custom ordered in the size you need. If you are interested in any of these rings, or would like to see the other new things I've added, be sure to stop by my Etsy Shop, Jen's Ink Spot! Thanks for stopping by!! I appreciate all of you! I was excited to play with these stamp sets today! They are just so much FUN! I based this card on Clean & Simple's Sketch #99 that you can play along with here. I have always loved library card images! I worked in a library for fours years during college and so when I saw this $5 PTI library card image, it spoke to me! LOL! 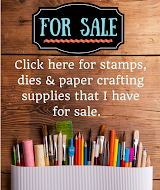 I stamped the ruler image (another image that has been on my wish list since I first began stamping YEARS ago!) on the ticket die border to get a fun border effect. A fun fact: the markings in this ruler are true to life! So, on the image, the 1 inch mark is truly 1 inch, 2 inch mark is really 2 inches, etc! How cool is that! And, look at this! I'm talking about the ticket edge and that score line on the notebook paper. LOVE!! Nichole Heady is just pure genius to design a die that will do this and look so authentic! Thanks for stopping by! Hope you enjoyed this card! Thank you again for your comments too! They just make my day! I attended a wedding today (that Dwight officiated, which was fun for me to watch) and the wedding colors were red & black so I wanted to make a card for the happy couple using those colors. You can see my envelope in the background. I lined it using the PTI envelope liner die. 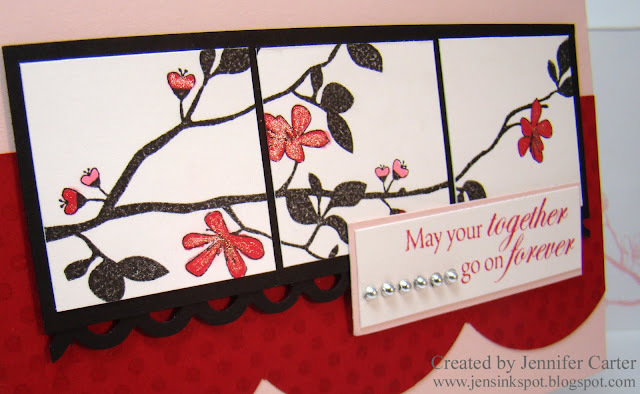 I also stamped the branch image in Sweet Blush Ink on the front of the envelope. 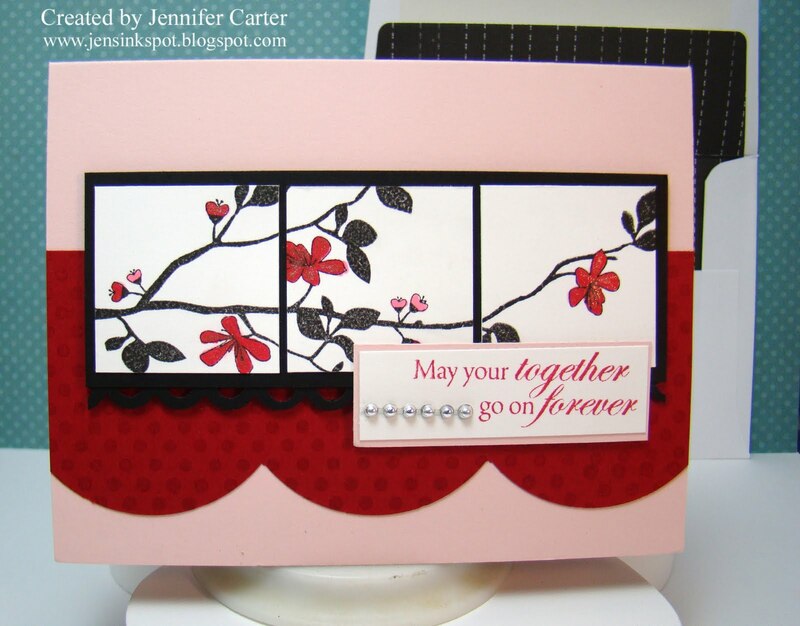 I based the layout of this card off of Natasha's Clean & Simple sketch #98. 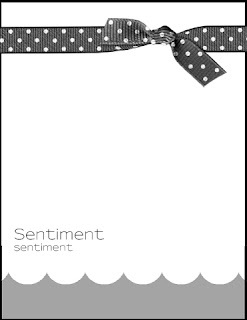 The black layer with the white squares are popped up on pop dots and so is the sentiment. Thanks for stopping by! Hope you enjoyed your visit! I have an inspiration book that I put together some time ago and I wanted to share it with you today. It's very basic but I love to flip to it when I need some inspiration along the way! Here's the outside. It's a fun binder that I found at Target, but I just loved all the colors! I have the inside divided into four sections. The first section is a picture of the stamp sets that I have. 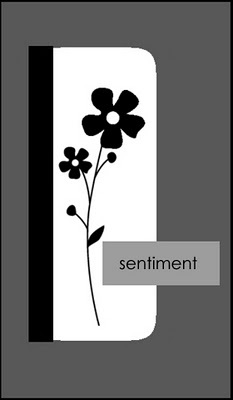 I turn to this section OFTEN when I am looking for a certain sentiment or type of image. I just print off a copy of each of the stamp sets I own from online and then I have a reference for what I have in my collection. If I am looking for a "Happy Anniversary" stamp and can't remember what I have, I just start flipping through the pages until I find the one sentiment that is just perfect! It's amazing how many times I forget what a certain stamp set contains! The next section contains color combinations. As I find color combos that I like or that I want to remember, I save them to a Publisher file and then when the page is full, I print it and add it to my binder. I have tons of pages filled with color ideas. It gets me outside my comfort zone sometimes which is always good! The next section is for sketches. Again, this is such a wonderful resource! As I find sketches I save them to a file and then print and add them to my binder. Some sketch websites have their sketches already on a PDF file that you can download. It's is wonderful! I use this section a lot and often I'll combine certain elements of sketches to create just what I want. The last section is a resource section and it doesn't have a lot in it right now. It lists PTI colors and copic colors, etc. It's nice to have all this information in one file and easy to access at all times! My book is kind of thick, but that is OK because I don't always start at page one and it is organized. Sometimes I'll turn to the middle of a section and start from there when I'm looking for inspiration so I'm not always looking at the same thing. This is such a great resource for me. I hope it gives you some ideas too!